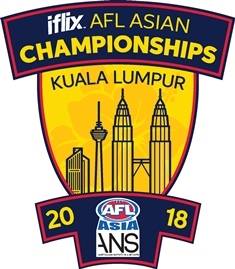 The AFL season may be over, however it’s the business end of the football season in Asia, with the AFL Asia’s 2018 iflix Asian Championships & Inaugural AFLW Asian Championships taking place at the Bukit Kiara Equestrian & Country Resort in Kuala Lumpur, Malaysia this Saturday, October 13th. This year’s biggest ever ‘Asian Champs’ will see 5 Division 1 Men’s Teams, 12 Division 2 Men’s Teams and 4 Women’s Teams fighting it out for the ultimate glory in Asian Football. The AFL Asia’s showcase event is expecting over 500 participants from 13 different countries to attend, including approximately 100 females, which is an outstanding result. AFL Asia’s hosting nation, the Malaysian Warriors, have secured iflix as the tournament’s naming rights sponsor, who will provide live coverage of the Asian Championships via their subscription on demand for free and there will also be a live-stream available via AFL Asia’s Facebook Page. AFL Asia’s 19th Annual Asian Championships is expected to see an increase in local Asian born talent on display and will feature AFL Asia’s first ever Asian born female umpire adjudicating at this level. Another one of AFL Asia’s focuses throughout the 2018 season has been to grow, nurture and develop Women’s football and as the figures above suggest, it has paid off in spades. The AFL Asia 2018 iflix Asian Championships and Inaugural AFLW Asian Championships is going to ginormous and you can check out all the action live via your iflix subscription or via the AFL Asia Facebook Page!